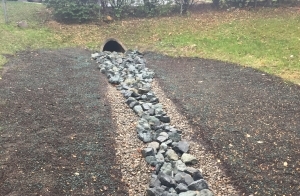 There’s no denying it—management of water through drainage and grading must be considered for any project on your Northern New Jersey property. Too often, it is overlooked, missed or improperly handled. As a result, improper grading and drainage installation stands as the top reason that structures, walls and driveways fail, basements flood and wet areas stand in your yard and lawn. But you don’t need to live with flooding or standing water on your property. Rather than worrying about every major rain or snowfall, let the Castle Point Landscape Design team help you change your yard for the better. Our drainage and grading services can prevent water damage by taking action to direct water away from the foundation of your home. Our experts have the tools and experience to ensure that your yard thrives in every way possible. You may have flooding issues or you may just want a flatter lawn. No matter the reason, expert drainage and grading services can boost the health of your landscape and ensure the safety of your home. Prevent Water Damage. Improper drainage doesn’t just damage your landscape; it can also damage the foundation of your home. When a severe rainstorm or snowfall strikes, water flows through your yard much faster. Without proper drainage, this fast-moving water can force its way through cracks in your foundation. This not only causes damage to the foundation of your house, it also causes the added problem of water in your basement. Thankfully, proper drainage solutions can redirect runoff and safeguard your home. Reduced Erosion. When it rains on uneven yards, all of the topsoil and fertilizers you put down will be displaced from your landscape to other areas of your yard in a matter of months. This is referred to as “soil erosion.” It’s aggravating at best and contributes to pollution at worst. Regrading will prevent topsoil loss, help keep fertilizer where you put it and keep pollutants out of groundwater. No More Standing Water. Standing water in your yard not only creates dangerous and slippery surfaces, but it also drowns your property. Perhaps worst of all, it attracts mosquitoes. Professional drainage solutions help lawns avoid puddling and remain vibrant (without those frustrating, little flies). More Usable Space. Hilly properties can be difficult to mow and even harder to landscape. A flat or properly graded lawn opens up your possibilities to gardening beds, patios, decks and even water features. Storm Water Management. As you know, when it rains, it pours. Unfortunately, allowing storm water to accumulate and linger on your property can create huge problems. But, thankfully, from drainpipes to drywells, installing one of our custom-designed drainage solutions can safeguard your outdoor space from catastrophe. Our systems will maintain your landscape, protect your property value and shield your home’s water from contamination and pollution—the whole nine yards. So, with us on your side, your land—and your budget—can effectively weather any storm. When it comes to identifying and remediating a landscape problem, lawn grading and drainage are often great solutions that will ensure that the soil and area surrounding your home receives the proper amount of water—no more and no less. At Castle Point Landscape Design, we provide expert drainage and grading services to correct water problems, including water in your basement, low areas around your foundation, downspout burial and extensions, repair of low spots in your yard and more. Our experts carefully assess your property and your home to identify the source of the water, where it’s collecting and what problems are associated with it. From there, we will provide a cost-effective solution to remediate any problem and ensure that your landscape is safeguarded and your home is fully protected. Call 908.512.2267 or email our team of grading and landscape drainage experts today.